Media-and-fast food cross promotions, like the ubiquitous movie-themed Happy Meal toys at McDonald’s, are typically pedestrian, pointless, and rarely warrant much attention — notwithstanding my curmudgeonly paranoid perception that the pairings represent a sinister alliance between the megaconglomerates that control the crap we eat and the crap we watch. This new one, however, is an exception. If you’ve yet to be introduced, meet Domo-kun, a furry, four-cornered mascot of Japan’s NHK broadcasting company. 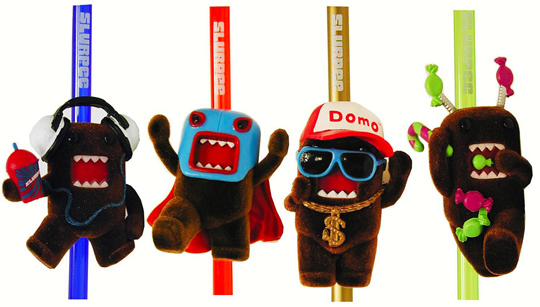 In a six week promo stretching into the middle of November, Domo will be gracing coffee cups, hot dog boxes and Slurpee Big Gulps at 7-Eleven. This entry was posted in Shoot the Messenger and tagged 7-Eleven, cross promotions, domo, domo-kun, NHK, slurpees. Bookmark the permalink.